We have made a trip to Kaufbeuren to spend a couple of days with Fabian and his family. This was achieved by a train journey from Ulm with two changes. The train was a regional train, cheap, no reservations needed, but it filled quickly with hiking groups and cyclists heading out of town for weekend activities. The second leg was hilarious as the bike carriage was filled to capacity and the refreshments lady couldn’t get through. She insisted on a reorganisation of the carriage, which initially appeared impossible, but was achieved with good spirits and the help of a few people. There still wasn’t enough room for the refreshments cart to fit through but all felt better for the effort expended and the neatness that resulted. We had second breakfast with Fabian’s parents, Margaret and Karl and their house guests, then took a walk around the old town of Kaufbeuren with Fabian as our guide. Then we set off for a car tour of the region. First site of historic interest was Marktoberdorf school which Paul attended in 2004-5 on his exchange to Germany. Fabian told us the story of why he went to this school instead of the local Kaufbeuren school: he heard from his older brother that the Marktoberdorf school had a tea and ice tea machine and he was so thrilled by this prospect that he begged his parents and even cried to be allowed to go there. All because of the ice tea!! But is was quite a good school as well. As we came closer the the alps the weather began to improve. We haughtily dismissed the hoardes of tourists who were in traffic jams and long queues to visit Schloss Neuschwanstein (the famous castle of mad King Ludwig) and we just glanced at it as we went past. Our better idea was to go in the cable car to Tegelberg at 1720m and admire the view from there. At the top we watched hang gliders and paragliders launching and walked up the steep path to the Branderschrofen at 1879 m with a large cross on the summit. By now the sun was out and the view in all directions magnificent. Fabian’s moccasins got him up but his trousers were not really designed for this type of activity and they let him down by ripping apart. He coped pretty well with these adversities. We descended after sufficient admiration of views had been done. Looking up to Tegelberg the paragliders looked like a swarm of colourful flies. 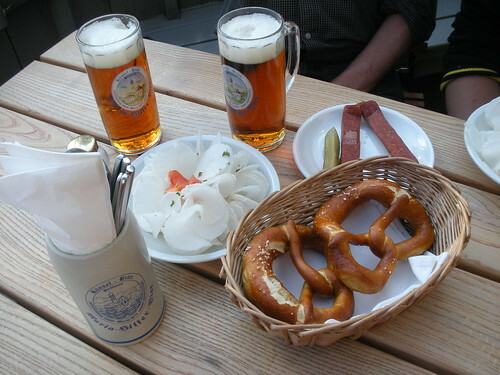 We drove on to a small brewery in the village of Speiden that makes the best beer in Bavaria (Mariahilfer), so we sampled the beer and also had some brezeln and Rettichsalat, a Bavarian salad made from a long white radish that is shaved into a thin spiral with a special Bavarian radish shaving machine. 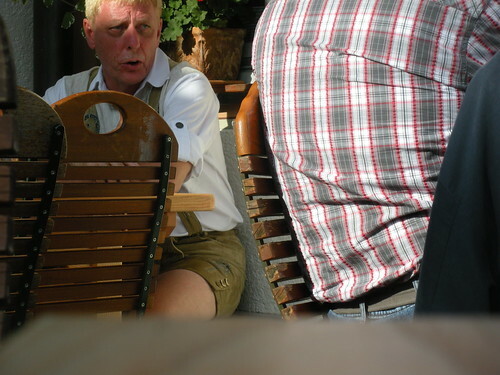 Quite a lot of Bavarians choose to wear lederhosen when they’re out walking (which inevitably means eating and drinking too) although this gentleman was not really dressed or speaking in true Bavarian style. Not many dirndl dresses! We had a few detours on the way home because the Bavarians do road works in August and close off lots of roads. It has been statistically proven that this is the best time to do the repairs and the Bavarians love statistics and act accordingly. 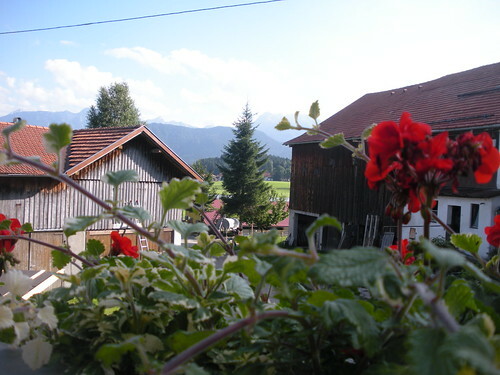 This entry was posted on 7 August 2010 at 8:16 pm and is filed under Germany. You can follow any responses to this entry through the RSS 2.0 feed. You can leave a response, or trackback from your own site. Great to hear of your adventures. Do your on-the-road web skills extend to creating a map of your route for the geographically illiterate among us?